The world of golf is becoming much more aware of the importance of utilizing the ground to maximize efficiency and power in a golf swing. Today’s game has so much emphasis on maximizing distance that knowing how to create speed and power is critically important to being a competitive golfer, and this begins with footwork and ground interaction. A recent article by BodiTrak highlights how Rory McIlroy utilizes the ground to generate power. 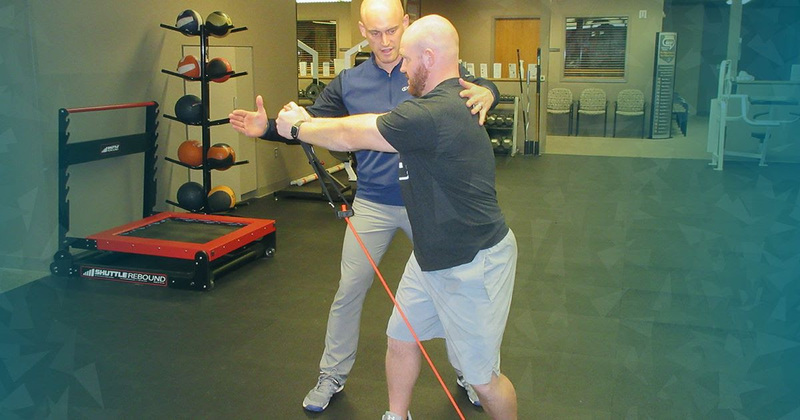 Being a golf medical provider, I have seen many trends as to how body limitations and injuries can impact a golfers interaction with the ground. When assessing a player's interaction with the ground, I assess the pressure in each foot, the timing and velocity of pressure shifts, and the timing and amplitude of ground reaction forces using BodiTrak pressure mats. Certain trends can be observed with each of these variables as they relate to physical limitations and previous injuries. In the following paragraphs I will break down how these variables may be impacted by lower extremity injuries and body limitations. I strongly believe that the ankle is one of the most overlooked and underrated body parts in sports, especially golf. It plays a vital role on how we can utilize the ground as well as its impact on swing mechanics. 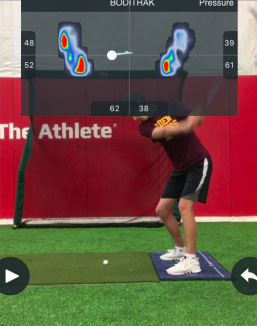 In a normal backswing, a player will load the majority of their pressure on the inside of their trail foot while keeping the rest of the lower extremity stable. This position allows for a forceful transition to the lead leg. To do this, you actually create eversion of the ankle. Those with history of ankle sprains in the trail leg may have limitations with ankle eversion. Instead, they might load the lateral aspect of the foot and sway in the backswing. On the right is an example of a D1 golfer who has limited eversion of trail ankle. Notice he is loading heavily on lateral aspect of his foot. This can affect their ability to push off the trail leg and change the timing and the speed of which they transition to lead side. When golfers are more tentative with their transfer to the lead side, their GRF tends to be highest at a later point in the downswing (closer to impact. Generally, a trend we see in elite ball-strikers is that they have pressure on their lead side earlier in the downswing, most notably at shaft vertical on the downswing. This is an important characteristic of golfers who are most effective at using the ground to generate clubhead speed. Dorsiflexion limitations are commonly found in those with achilles tendinopathies, previous ankle sprains and a multitude of other injuries. I usually will notice DF mobility limitations when assessing the overhead deep squat as described by the SFMA. 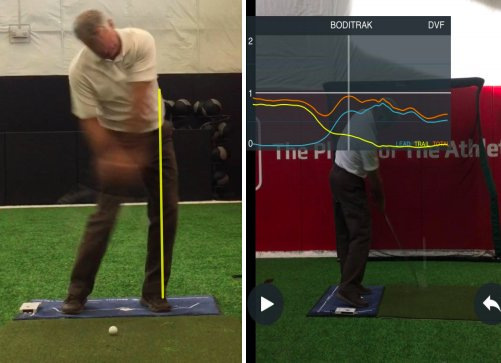 TPI has found a strong correlation with limitations in the overhead deep squat and early extending in the downswing. Frequently, overhead squat limitations can be rooted in dorsiflexion mobility impairments. This causes altered movement patterns in a squat that tend to replicate in the golf swing resulting in early extension. When assessing pressure changes in early extension, you will see a pressure trace moving anterior with pressure more on the toes throughout the downsing and at impact. The relationship between ankle and early extension is discussed by Dr. Greg Rose in this article. The knees are a more stable joint, compared to the mobile ankle and hip joints. However, previous knee injuries will tend to negatively impact quad strength and stability in the knee. This is critically important on the lead side. Golfers rely on the ability to push off on the lead leg to effectively transfer energy through the body to the clubhead and maximize speed. The ability to do this can be impacted when quad strength deficits, decreased neuromuscular control, and poor loading strategies are present. This will occur following injuries such as past ACL tears, meniscus tears, and chronic issues such as osteoarthritis. 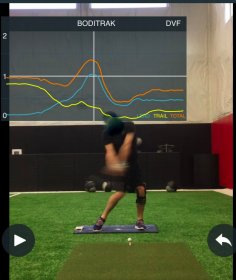 That weakness and instability in the knee can affect the timing of the pressure shift and limit GRF as they are not comfortable transferring weight quickly or forcefully into the lead leg, resulting in max GRF at impact compared to early in the downswing, again decreasing potential to maximize clubhead speed. Any decrease in ability to rotate the hips in either side will significantly reduce a golfer's ability to effectively load that side. Arthritic changes in the hip joint, labral pathologies, CAM and PINCER lesions, among others pathologies will all affect the ability to rotate. When golfers can not rotate well around their hip, they may demonstrate various swing characteristics such as a sway and slide, reverse spine angle, early extension, among others. When hip pathologies are present or a history of hip injuries/surgeries (i.e. hip replacement) they tend to have glute strength reductions as well. TPI refers to the glutes as the “King of the Swing.” Without glute strength, any number of swing faults may be present due to the inability to adequately load the affected limb which will alter your kinematic sequence and cause many compensatory movement patterns. You will also demonstrate a limited ability strong GRF and transfer weight. To the right is a classic example of a senior golfer who has significant limitations in hip rotation due to osteoarthritis. Notice the slide at impact, thus decreasing his ability to generate high GRF and doesn't achieve this max GRF until after impact (Second picture). First, it is imperative to determine the cause of limitation. Following a detailed history, I typically utilize the SFMA along with localized testing to determine limitations. I will always correct mobility deficits first with manual techniques and reinforcement exercises. When they possess adequate mobility we can work on improving stability and motor control. On the right is an example of a golfer that has torn his left ACL four times and he is now ACL deficient in the left knee. A swing and pressure analysis revealed him sliding a bit at impact, and maximum GRF near impact. Knowing he has significant strength limitations from other testing, he also had potential to improve his GRF, thus increasing clubhead speed. Follow Adam on Twitter and Instagram @adamhalseth.